I shall refrain today from gushing about my gorgeous pup and will instead share with you a discovery: the best way to roast a pepper (capsicum). What’s wrong with the normal ways, I hear you ask. The most common method of roasting a pepper is to place them whole in a hot oven or over coals. Undeniably, this creates perfectly cooked, juicy flesh but the post-cooking removal of the seeds makes me swear furiously. Those sticky little buggers get everywhere! Another popular option is to cut the peppers into sections and then roast them. No seed problems with this method but, more often than not, by the time the skin is charred, the flesh has dried out. Placing the same slices under a grill has the opposite drawback: the skin chars too quickly leaving the pepper still quite crunchy. It’s a dilemma. Or it was, anyway. I’ve now discovered that combining these latter two methods works an absolute treat. Juicy flesh, easy peel skin and no sticky seeds. What more could a pepper lover want? Cut the peppers into quarters lengthways and remove seeds and white bits. Rub with olive oil and a little salt and place skin down on a baking tray. Roast for 20 mins in a 190oC oven. Turn the peppers skin up and place under a very hot grill. Grill until skins are just blistered and blackened. Place hot peppers into a bowl and cover with clingfilm. Leave to cool. Add to sandwiches. The moistness of the peppers means mayo or butter isn’t necessary. Blitz with buttermilk and a little cayenne to create a vibrant sauce. Or my current favourite use: with puy lentils, deseeded tomatoes, roasted aubergine, parsley and a balsalmic/olive oil dressing. This is interesting Wendy as I have always grilled peppers then put them into a plastic bag until cooled. The bag helps sweat off the skin but it is still a very finickety job to get the skins off. 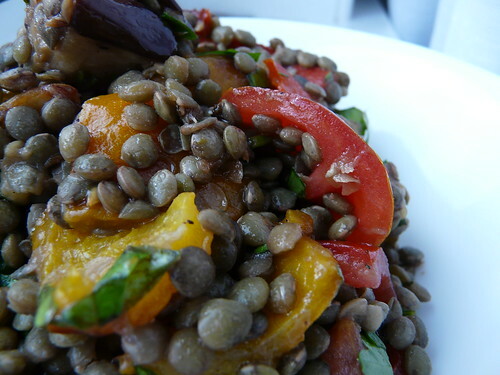 Your puy lentil dish looks yummy. My how times have changed…I still prefer roasting whole as I insist upon having that slight smoky flavour and as for the seeds, pulling the stem away from the pepper removes most of the stems, hence saving you from uttering cussin’ words. Blitzed with buttermilk and cayenne…now that’s a delicious sounding thing. Shona – The plastic bag does the same as the cling film. It’s the seeds that drive me crazy! Do you roast yours whole? I think I have to try your method. I end up doing a bushel each year and do them on the gas bbq. The seeds do cause me to say things that I wouldn’t normally say. I’ve tried all different ways, and this is definitely the least messy. Great idea, Wendy! i iusually do either oven or grill depending on weather and whim – and put them in the plastic bag – my biggest problems is burning my fingers when I am pushed for time! Gen – 🙂 He’s lying beside me woofing in his sleep just now. So cute! Giz – Ahhh, you understand me! I just can’t cope with those seeds. Johanna – Yup, more problems. If they weren’t so very tasty I’d have given up on them years ago. Your photos are beautiful and I love the recipe too, simple, healthy and lot’s of fiber! I always grill my pepper whole and I don’t really mind with the trouble, because in my opinion, they taste better. That just me! On different subject, I just have to leave you comment for your new adorable spaniel. He is so cute (although he looks so shy) I would keep his name “Marco”. I have 2 golden retrievers, they are adorable too. Cheers. 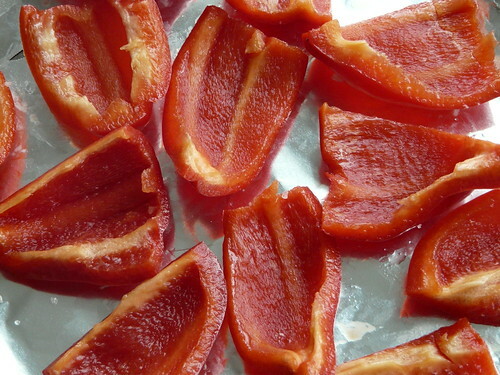 Oh, how I love roasted peppers, let me count the ways. And, here’s another one to add to my list! Thanks for the helpful suggestions for easing the mess. Christina – You’re very welcome. I just hate those seeds! I don’t mind ’em a bit crunchy. And I’m a bit of plastic-bag/cling-film-ophobe (how’s that for a neologism?) so put them in a lidded chinese bowl. And Wendy, the Devil Drink has answered your whisky question. Beg your pardon, not at that link he hasn’t. Try here. ps. You can also stuff deseeded and cored pepper with feta/goat cheese mashed with a bit of egg and then egg and flour them and flash fry them in a pan for a truly superb starter! This works best with the long sweet green peppers but you can do it with red/yellow as well. Essential ingredient for my favourite sandwich. Cream cheese, smoked Black Forest ham and roasted peppers. Just to let you know that your article may be a few years old but I’ve just found it on Google and your idea works a treat. Thanks, this method worked perfectly for me, saved me hours of messing about. Love roasted peppers. We always have these when in Crete but why on earth remove the skins. We eat the lot and delicious they are. just doing some now! Thanks…you just answered my question….do you have to remove the skins ?? With some applications, the skin ends up stringy, like dental floss, which distracts from the rich wholesome tang of the pepper’s flesh. I’ve never turned my nose up at a roasted pepper with its skin still on, however! I’ve just pulled a bagful of poblano peppers off of a plant I grew… thinking of making a knock-off of a burger from a place in town that they call the “Green Monster,” … it has roasted poblano peppers, gruyere cheese, … and I always add roasted garlic and jalapenos. Thanks for the tips! 🙂 Turned out nice!